An astonishing new report suggests that a small red dwarf star may have grazed our solar system 70,000 years ago. 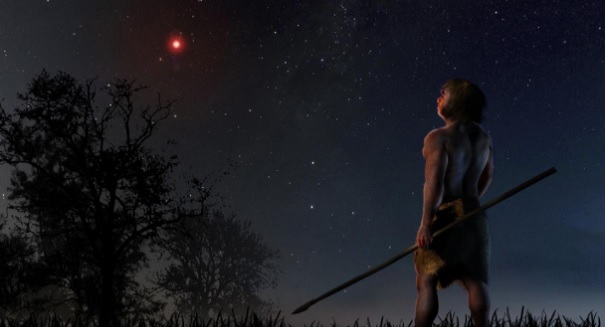 Scientists have just come to the extraordinary conclusion that a small star may have flown close to Earth 70,000 years ago, back when modern humans were sharing the Earth with Neanderthals. A team of researchers say that a red dwarf called Scholz’s star may have grazed the solar system those many years ago, coming within 1 light year of the sun, which is quite close compared to the distance of 4.2 light years of Proxima Centauri, our closest neighbor. Scientists were able to determine this by measuring the motion and velocity of Scholz’s star, which has a small brown dwarf or “failed star” caught in its gravitational pull. The star would have appeared as a faint reddish light to the modern humans wandering the Earth at the time, and must have been a very strange sight indeed. Scientists do not think that this star disturbed any of the objects in the solar system. Their findings were published in the journal Astrophysical Journal Letters.